Scientists indicated that moderate to substantial agreement between Early Treatment Diabetic Retinopathy Study 7-field imaging and ultra-widefield imaging has been suggested in single-center studies. Comparing images obtained by multiple centers could increase confidence that UWF images can be used reliably in place of ETDRS imaging in future clinical trials, they added. They aimed to compare diabetic retinopathy severity from modified ETDRS 7-field imaging and UWF imaging. 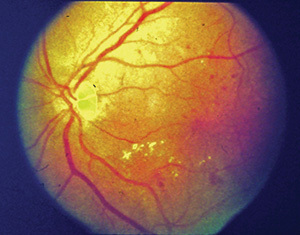 This preplanned, cross-sectional analysis included modified ETDRS 7-field images, obtained using the Diabetic Retinopathy Clinical Research Network acquisition protocol, and UWF images, captured with the Optos 200Tx system, from adult participants (≥18 years old) with type 1 or 2 diabetes. Both image types were evaluated by trained graders masked to clinical data. Main outcomes and measures included agreement between UWF images, UWF images masked to include only the ETDRS 7-field area and ETDRS 7-field images calculated using κ statistics. A total of 764 eyes from 385 participants were included, with a median (IQR) age of 62.2 (53.6 to 69.2) years; 194 (50.4 percent) were women, and 256 (66.5 percent) were white. • Of 742 eyes, 359 (48.4 percent [CI, 44.4 to 52.4 percent]) eyes had exact agreement, and 653 eyes (88 percent [CI, 85.2 to 90.3 percent]) agreed within one step (weighted κ, 0.51 [CI, 0.44 to 0.58]). • After open adjudication by an independent senior grader of images with more than a two-step discrepancy, perfect agreement was found in 435 eyes (59 percent [CI, 55.1 to 62.8 percent]); and agreement within one step was found in in 714 eyes (96.9 percent [CI, 95.1 to 98 percent]; κ, 0.77 [CI, 0.73 to 0.82]). • Ability of the imaging modalities to detect retinopathy severity in an eye was considered similar in 59 eyes (50.9 percent [CI, 41.3 to 60.4 percent]), better for ETDRS 7-field imaging in 22 eyes (19 percent [CI, 12.5 to 27.7 percent]) and better for UWF-masked images in 31 eyes (26.7 percent [CI 18.8 to 36.5 percent]). • Comparing UWF masked and unmasked images, 94 of 751 eyes (12.5 percent) had DR graded as at least one step more severe on UWF unmasked images vs. UWF masked images. • Predominantly peripheral DR lesions were present in 308 of 751 eyes (41 percent); this suggested increased DR severity by two or more steps in 34 eyes (11 percent). Scientists determined that imaging by ETDRS 7-field and UWF imaging systems had moderate to substantial agreement when evaluating the severity of DR within the seven standard fields. Disparities within an individual eye were equivalently distributed between imaging modalities, and could be better or worse on one or the other. Researchers wrote that longitudinal follow-up could help determine if peripheral retinal findings were associated with future retinopathy outcomes. SOURCE: Aiello LP, Odia I, Glassman AR, et al. Comparison of early treatment diabetic retinopathy study standard 7-field imaging with ultrawide-field imaging for determining severity of diabetic retinopathy. JAMA Ophthalmol 2018; Oct 18. [Epub ahead of print]. Several research groups are focusing on different aspects of diabetic retinopathy diagnosis. Researchers evaluated the diagnostic performance of deep learning-based algorithms in screening individuals with diabetes for diabetic retinopathy, and compared the algorithms to the current gold standard of classification by human specialists, as part of a systematic review. They aimed to identify studies that incorporated the use of deep learning in classifying full-scale DR in retinal fundus images of individuals with diabetes. The studies had to provide a DR-grading scale, a human grader as a reference standard and a deep learning performance score. A systematic search on April 5, 2018, through Medline and Embase yielded 304 publications. Researchers employed the Quality Assessment of Diagnostic Accuracy Studies tool for risk of bias and applicability assessment. Based on objective selection, they included 11 diagnostic accuracy studies that validated the performance of their deep learning method using a new group of individuals or retrospective datasets. •	Eight studies reported sensitivity of 80.28 percent to 100 percent, and specificity of 84 percent to 99 percent. •	Two studies reported accuracies of 78.7 and 81 percent. •	One study provided an area under the receiver operating curve of 0.955. •	One study revealed that 78 percent of individuals preferred an automated deep learning model over manual human grading. Researchers wrote that advantages of implementing deep learning-based algorithms in DR-screening included reduction in manpower, cost of screening, and issues relating to intra- and intergrader variability. However, they added that limitations that might hinder such an implementation revolved around ethical concerns regarding lack of trust in the diagnostic accuracy of computers. That said, researchers concluded that automated DR classification using deep learning could be feasible in a real-world screening scenario. SOURCE: Nielsen KB, Lautrup ML, Andersen JKH, et al. Deep learning-based algorithms in screening of diabetic retinopathy: A systematic review of diagnostic performance. Ophthalmology Retina 2018; Nov. 2. [Epub ahead of print]. Differentiating factors included the existence of hard exudates, hyperreflective foci and subretinal fluid, along with ME patterns and location of cysts within retinal layers. Using three to six SD-OCT parameters, investigators achieved a 94 to 98 percent sensitivity, 94 to 95 percent specificity, and an area under the curve of 0.937 to 0.987 (depending on the method) for confirming diabetic etiology. A decision flowchart achieved a 96-percent sensitivity, a 95-percent specificity and an area under the curve of 0.937. Investigators analyzed structural optical coherence tomography images from eyes with non-exudative age-related macular degeneration for the presence of double-layer signs to determine if the signs predicted subclinical macular neovascularization, as part of a prospective, observational study. Participants included non-exudative individuals with AMD with and without subclinical MNV identified by swept-source OCT angiography. Subjects were enrolled prospectively in a SS-OCTA imaging study. A set of test scans with and without subclinical MNV was compiled to assess the ability of trained graders to identify non-exudative type 1 MNV. The graders only evaluated the structural OCT B scans of those eyes. The presence of a double-layer sign was used as a predictive sign for subclinical type 1 MNV. Sensitivity, specificity, positive predictive value and negative predictive value from two separate gradings were calculated and compared. •	Double-layer signs were detected in 24 of 33 eyes with subclinical MNV, but not in 56 of 67 eyes without MNV. •	Sensitivity was 73 percent; specificity was 84 percent; PPV was 69 percent; and NPV was 86. •	The senior grader detected double-layer signs in 29 of 33 eyes with subclinical MNV; but not in 58 of 67 eyes without MNV, achieving a sensitivity of 88 percent, specificity of 87 percent, PPV of 76 percent; and NPV of 94 percent. •	For all graders, statistically significant associations were found between type 1 MNV and double-layer signs (p<0.001). Investigators determined that double-layer signs on structural OCT B scans were associated with subclinical type 1 MNV and could be used to identify the lesions with good predictive values in eyes with non-exudative AMD. SOURCE: Shi Y, Motulsky EH, Goldhardt R, et al. Novel predictors of visual outcome in anti-VEGF therapy for myopic choroidal neovascularization derived using OCT angiography. Ophthalmology 2018; Oct. 29. [Epub ahead of print]. Investigators analyzed the characteristics of choriocapillaris flow based on the underlying choroidal vasculature in fellow eyes with central serous chorioretinopathy, in 57 cases with CSC and normal controls. •	The mean vascular density of the choriocapillaris in the CSC group wasn’t different from that of the control group (p=0.289). •	The flow void area was more frequently found in the CSC group (59.6 percent) than in controls (29.8 percent, p=0.002). •	The presence of the flow void area in the CSC group was associated with greater macular choroidal thickness (p=0.004). •	In the CSC group, the mean flow void area and ratio of the choriocapillaris over the vascular bed were larger than those over the stromal bed (all p<0.001). Investigators determined that the location of the flow void area of the choriocapillaris was associated with the distribution of the underlying choroidal vessels, suggesting that the underlying choroidal vessels might affect choriocapillaris perfusion in pachychoroid eyes. SOURCE: Yun C, Huh J, Ahn SM, et al. Choriocapillaris flow features and choroidal vasculature in the fellow eyes of patients with acute central serous chorioretinopathy. Graefes Arch Clin Exp Ophthalmol 2018; Nov. 5. [Epub ahead of print]. Researchers assessed the efficacy and safety of sarilumab, a human anti-interleukin-6 receptor antibody, for the treatment of noninfectious uveitis of the posterior segment, as part of a randomized, double-masked, placebo-controlled Phase II study. Participants included 58 eyes with noninfectious intermediate, posterior or pan-uveitis. Eyes were randomized 2:1 to treatment q2 weeks for 16 weeks with subcutaneous sarilumab 200 mg or placebo. The primary endpoint was the proportion of individuals with ≥2-step reduction in vitreous haze (VH) on the Miami scale, or reduction of systemic corticosteroids (prednisolone or equivalent) to a dose of <10 mg/day at week 16. The primary endpoint was based on VH evaluation by a central reading center. Investigator evaluation of VH was a pre-specified, secondary analysis. 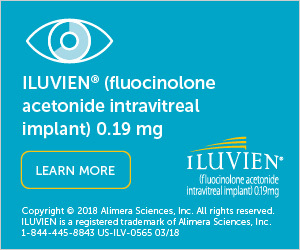 Researchers analyzed the efficacy of an intraoperative intravitreal dexamethasone implant for macular edema secondary to diabetic retinopathy, retinal vein occlusion and noninfectious posterior uveitis, as part of a retrospective review of 62 individuals (29 men and 33 women; mean age 51.19 ±14.41 years; 65 eyes). They postoperatively assessed best-corrected visual acuity (in logMAR), central foveal thickness, intraocular pressure and postoperative edema-free periods up to one year. Researchers compared preoperative and postoperative numbers of other intravitreal injections. •	Best-corrected visual acuity gradually improved in the DME group (from 0.87 to 0.51, or around 20/160 to 20/63) but failed to improve from month three onward in the RVO and uveitis groups. •	Central foveal thickness decreased in all groups, especially in the DME group (from 550.93 to 338.10 μm). •	The edema-free period was longest in the DME group (19.34 ±15.12 months), followed by the uveitis (12.91 ±7.85 months) and RVO (8.50 ±8.76 months) groups. •	Subjects in the uveitis group used more IOP-lowering agents (1 ±1.27) than those in the DME (0.13 ±0.49) and RVO (0.36 ±0.79) groups. •	Increased IOP events were most frequent in postoperative week one, especially in the uveitis group. Researchers concluded that vitrectomy combined with an intravitreal dexamethasone implant for DME, RVO and noninfectious posterior uveitis had a favorable clinical outcome. SOURCE: Pang JP, Son G, Yoon YH, et al. Combined vitrectomy with intravitreal dexamethasone implant for refractory macular edema secondary to diabetic retinopathy, retinal vein occlusion, and noninfectious posterior uveitis. Retina 2018; Oct 10. [Epub ahead of print]. Researchers estimated the success and safety of diagnostic pars plana vitrectomy in determining the etiology of uveitis. They searched PubMed, Embase and Ovid up to October 2017 to identify relevant studies, and performed various statistical analyses. Researchers also assessed the statistical heterogeneity by the chi-square test and I2 statistics, and performed sensitivity analysis and subgroup analyses to identify the source of heterogeneity. They also evaluated publication bias by the Egger test. Sixteen studies involving 1,195 individuals were included. The pooling result showed the successful rate of diagnostic PPV was 44 percent (CI [39 percent ∼50 percent). •	Among individuals whose diagnostic PPV yielded a definitive diagnosis, 69 percent were infectious uveitis (CI [61 to ∼77 percent]), 23 percent were lymphoma (CI [17 to ∼30 percent]) and 4 percent were metastatic carcinoma (CI [2 to ∼10 percent]). •	Among those diagnosed with infectious uveitis, the most frequent pathogens identified were viruses, followed by bacteria, Toxocara canis, Toxoplasma gondii, tuberculosis and fungus. •	The incidence of postoperative cataract and postoperative retinal detachment was 19 percent (CI, 8 to ∼29 percent) and 5 percent (CI, 1 to ∼10 percent), respectively, and the rate of secondary vitrectomy surgery was 10 percent (CI, 2 to ∼22 percent). •	Postoperative visual improvement rate was 46 percent (CI, 39 to ∼52 percent), and the postoperative treatment strategy was changed in light of the results of diagnostic PPV in 20 percent of cases (CI, 10 to ∼29 percent). Researchers concluded that, for uveitis of unknown cause, diagnostic PPV appeared to be an effective, reliable, and relatively safe procedure for establishing the definite diagnosis and guiding further treatment. They added that positive therapeutic effect could also be achieved. SOURCE: Zhao XY, Xia S, Chen YX. Role of diagnostic pars plana vitrectomy in determining the etiology of uveitis initially unknown. Retina 2018; Oct 23. [Epub ahead of print]. Scientists looked at the prevalence of treatable complications (cystoid macular edema, epiretinal membrane and cataract) in consecutive cases with retinitis pigmentosa at a tertiary eye clinic in 2012. They used spectral-domain optical coherence tomography to determine the presence of CME and ERM, and reviewed clinical records to identify cataract and pseudophakia. Multivariable analyses adjusted for age, gender and other confounders. •	In 338 eyes of 169 subjects, CME was present in 58.6 percent of individuals and 50.9 percent of eyes, and was bilateral in 73.7 percent. •	ERM was present in 22.8 percent of eyes, cataract in 23.4 percent and pseudophakia in 11.2 percent. •	In multivariable analyses, CME was associated with younger age (OR, 0.81; CI, 0.67 to 0.98) but not with gender. •	Those with ERM and cataracts were less likely to have CME (OR, 0.19; CI, 0.09 to 0.40), as were individuals with ERM and pseudophakia (OR, 0.37; CI, 0.16 to 0.84). •	CME was most prevalent in individuals with autosomal-dominant inheritance (71.4 percent), followed by autosomal recessive/sporadic inheritance (58.9 percent). •	CME was least likely in people with X-linked inheritance (12.5 percent, p<0.001). Scientists reported that the prevalence of treatable RP complications was high, and suggested that screening individuals with RP to identify those who might benefit from interventions might be clinically beneficial. SOURCE: Liew G, Strong S, Bradley P, et al. Prevalence of cystoid macular oedema, epiretinal membrane and cataract in retinitis pigmentosa. Br J Ophthalmol 2018; Oct 5. [Epub ahead of print]. Novartis announced additional brolucizumab Phase III results from year two reaffirming its positive year-one findings. Brolucizumab met its primary endpoint of noninferiority vs. aflibercept in best-corrected visual acuity and exhibited superiority in key retinal outcomes at year one (48 weeks). Secondary endpoints at year two (96 weeks) reaffirmed superiority of brolucizumab 6 mg compared to aflibercept in reduction of retinal fluid, an important marker of disease activity in individuals with neovascular age-related macular degeneration. Read more. Genentech announced positive results from the Phase II STAIRWAY study, which explored the extended durability of faricimab (RG7716) in the treatment of wet age-related macular degeneration. At 52 weeks, faricimab subjects dosed either every 16 weeks or every 12 weeks demonstrated sustained vision outcomes comparable with ranibizumab dosed every four weeks. Results of the study were presented at the American Academy of Ophthalmology’s annual meeting in Chicago. Read more. Regenxbio announced updated positive results from the ongoing Phase I study of RGX-314 for the treatment of wet age-related macular degeneration. In the latest findings, cohort 3 subjects demonstrated evidence of sustained RGX-314 protein expression levels at six months, as measured from aqueous samples by an electrochemiluminescence immunoassay after administration of RGX-314. The results were presented at the Retina Subspecialty Day program at the American Academy of Ophthalmology 2018 annual meeting. Read more. Opthea announced positive data from its Phase Ib dose escalation study of OPT-302 for individuals with diabetic macular edema. The study evaluated three escalating dose levels of OPT-302 (0.3, 1 or 2 mg), a novel VEGF C/D “Trap” therapy, in combination with aflibercept (Eylea, 2.0 mg), administered once every four weeks for a total of three intravitreal injections, in nine individuals with persistent, central-involved DME despite suboptimal responses to standard of care anti-VEGF-A therapy. Read more. Clearside Biomedical announced that the primary endpoint wasn’t achieved in its Phase III clinical trial (SAPPHIRE) investigating the superiority of Xipere (formerly “suprachoroidal CLS-TA”) used with the intravitreal anti-VEGF agent Eylea (aflibercept) compared with intravitreal Eylea monotherapy for the treatment of retinal vein occlusion. The primary endpoint the treatment failed to meet was the proportion of individuals in the combination treatment arm compared with the intravitreal Eylea-alone control arm, with improvements in best-corrected visual acuity from baseline of at least 15 letters on the Early Treatment Diabetic Retinopathy Study scale at eight weeks after initial treatment. The company says it will discontinue clinical development of combination therapy for RVO, which includes SAPPHIRE and its companion Phase III clinical trial, TOPAZ. Read more. GenSight Biologics announced that the first subject was treated in the PIONEER Phase I/II clinical trial of GS030 at the Moorfields Eye Hospital in London. PIONEER is a multicenter, open-label, dose-escalation study of the safety and tolerability of GS030 in 18 subjects with retinitis pigmentosa. GS030 combines a gene therapy administered via a single intravitreal injection with a wearable optronic visual stimulation device. GS030 is based on the Optogenetics technology platform developed by GenSight, which uses gene therapy to introduce gene encoding for a light-sensitive protein into retinal ganglion cells by a single intravitreal injection, making them responsive to light and bypassing destroyed photoreceptors. Read more. Researchers from the University of California, Irvine School of Medicine, discovered that neurons located in the brain vision centers of blind rats functioned normally following fetal retina cell transplants, indicating the restoration of vision. During the study, sheets of fetal cells were integrated into the retina and generated nearly normal visual activity in the brains of blind rats. Measuring the response of neurons in the primary visual cortex, researchers demonstrated how rats with severe retinal degeneration receiving donor cells could become sensitive to various attributes of visual stimuli, including size, orientation and contrast, as early as three months following surgery. Read more. In addition, Ophthotech entered into an exclusive option agreement with the University of Pennsylvania and University of Florida Research Foundation for rights to negotiate to acquire an exclusive global license to develop and commercialize novel adeno-associated virus gene therapy product candidates for the treatment of Best vitelliform macular dystrophy, i.e., Best disease. Preclinical anatomical proof-of-concept studies conducted by Penn and the University of Florida demonstrated promising results in a canine Best disease model. Read more. IDx and Topcon signed an exclusivity agreement that will allow the companies to scale delivery of AI-based diagnostic solutions in the U.S. market, granting exclusive rights to IDx as the only autonomous AI company permitted to sell its products with the Topcon NW400, a robotic fundus camera. In turn, IDx agreed to assign Topcon's NW400 as the only robotic desktop fundus camera with less than a 55-degree field of view to be integrated with the IDx-DR autonomous AI system that is designed to detect diabetic retinopathy in fundus images. Read more. MacuLogix entered into an international distribution agreement with Optos, a provider of medical retinal imaging company and part of Nikon, Japan. Effective immediately, Optos in Europe and Australia will add the AdaptDx automated dark adaptometer to their existing portfolio of retina-focused medical devices, including the company’s exclusive ultra-widefield retinal imaging products. Read more.